Robert Safford Hale, Genealogy of descendants of Thomas Hale of Watton, England, and of Newbury, Mass., , at https://archive.org/stream/genealogyofdesce00hale . Albany, N.Y.: Weed, Parsons and Company, printers, (1889) , p. 206. Robert Safford Hale, Genealogy of descendants of Thomas Hale of Watton, England, and of Newbury, Mass., , at https://archive.org/stream/genealogyofdesce00hale . Albany, N.Y.: Weed, Parsons and Company, printers, (1889) , p. 337. Waterford, Maine Vital Records., , p. 408. 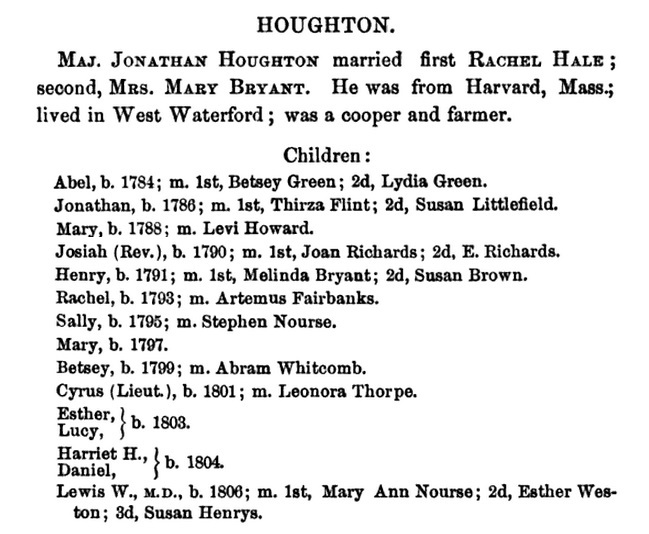 "Maine Births and Christenings, 1739-1900," database, FamilySearch (https://familysearch.org/ark:/61903/1:1:F4SC-RZJ : accessed 29 August 2015), Betsy Houghton, 01 Jun 1797; citing Waterford, Oxford, Maine; FHL microfilm 12,625. Robert Safford Hale, Genealogy of descendants of Thomas Hale of Watton, England, and of Newbury, Mass., , at https://archive.org/stream/genealogyofdesce00hale . Albany, N.Y.: Weed, Parsons and Company, printers, (1889) , p. 340. Robert Safford Hale, Genealogy of descendants of Thomas Hale of Watton, England, and of Newbury, Mass., , at https://archive.org/stream/genealogyofdesce00hale . Albany, N.Y.: Weed, Parsons and Company, printers, (1889) , p. 380. 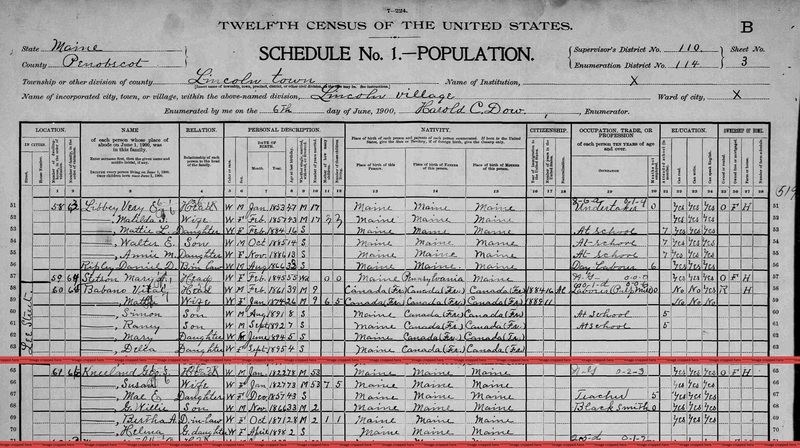 "United States Census, 1910," database with images, FamilySearch (https://familysearch.org/ark:/61903/1:1:MPVY-GB7 : 29 October 2015), Charles W Hale, Otter Creek, Eau Claire, Wisconsin, United States; citing enumeration district (ED) ED 62, sheet 4A, NARA microfilm publication T624 (Washington, D.C.: National Archives and Records Administration, n.d.); FHL microfilm 1,375,723. "United States Census, 1920," database with images, FamilySearch (https://familysearch.org/ark:/61903/1:1:MF2K-987 : 14 December 2015), Chas W Hale, Otter Creek, Eau Claire, Wisconsin, United States; citing sheet 5B, NARA microfilm publication T625 (Washington D.C.: National Archives and Records Administration, n.d.); FHL microfilm 1,821,984. Robert Safford Hale, Genealogy of descendants of Thomas Hale of Watton, England, and of Newbury, Mass., , at https://archive.org/stream/genealogyofdesce00hale . Albany, N.Y.: Weed, Parsons and Company, printers, (1889) , p. 339. Sarah Hale was born on March 11, 1791 in Waterford, Oxford County, Maine. She was the daughter of Oliver Hale and Eunice Fletcher. Sally died on January 5, 1864 at age 72. 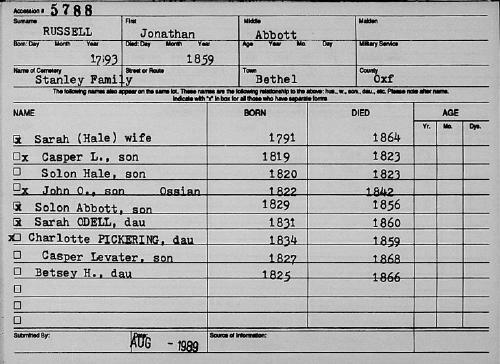 "Maine Marriages, 1771-1907," database, FamilySearch (https://familysearch.org/ark:/61903/1:1:F4X7-NJT : 4 December 2014), Jonathan Abbot Russell and Sally Hale, 18 May 1818; citing Civil, Waterford, Oxford, Maine, reference ; FHL microfilm 12,625. "Maine, Faylene Hutton Cemetery Collection, ca. 1780-1990," database with images, FamilySearch (https://familysearch.org/pal:/MM9.3.1/TH-1942-40623-32124-68?cc=2242151 : 16 April 2015), Rowe - Sanders > image 1552 of 3419; Maine State Library, Augusta. Robert Safford Hale, Genealogy of descendants of Thomas Hale of Watton, England, and of Newbury, Mass., , at https://archive.org/stream/genealogyofdesce00hale . Albany, N.Y.: Weed, Parsons and Company, printers, (1889) , p. 110. William Richard Cutter, Genealogical and personal memoirs relating to the families of Boston and eastern Massachusetts, Vol. 3, , at https://books.google.com/books?id=qaK9Vz1UdDcC . New York: Lewis historical Pub. Co., (1908) , p. 1321. Vital Records of Andover Massachusetts to the end of the year 1849, Topsfield, Mass. : Topsfield Historical Society, (1912) , p. 241.
living at Meridian Street, Boston, Massachusetts. Town and City Clerks of Massachusetts, Massachusetts Vital and Town Records, Provo, UT: Holbrook Research Institute (Jay and Delene Holbrook), , Boston > Marriages, 1800-1849, Vol. 2 > 175. 1830 United States. Census Office. 5th census, Census schedules, 1830, Washington [District of Columbia]: National Archives. Central Plains Region, (1949) , p. 214. Sons of the American Revolution Membership Applications, 1889-1970, Louisville, Kentucky: National Society of the Sons of the American Revolution, , Volume: 289; SAR Membership Number: 57798. Town and City Clerks of Massachusetts, Massachusetts Vital and Town Records, Provo, UT: Holbrook Research Institute (Jay and Delene Holbrook), , Boston > Marriages, 1844-1846 > 7. Oxford County (Maine). Register of Deeds, Deeds of the Western District, , vol. 40, p. 507. 1880 United States. Census Office. 10th census, 1880 federal population census, Washington, District of Columbia: National Archives and Records Service, ([19--]) , Census Place: Boston, Suffolk, Massachusetts; Roll: 552; Family History Film: 1254552; Page: 109A; Enumeration District: 579; Image: 0219. 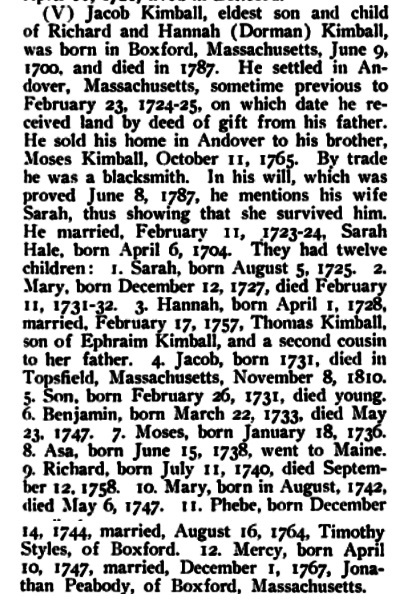 "Massachusetts, Deaths, 1841-1915," index and images, FamilySearch (https://familysearch.org/pal:/MM9.1.1/NW4Z-7BY : accessed 27 Nov 2012), Sarah H. Sawyer, 1887. Find A Grave Memorial# 76821495. Massachusetts Vital Records, 1841-1910, , Vol: 472 ; Page: 527. "Massachusetts, Births, 1841-1915," index and images, FamilySearch (https://familysearch.org/pal:/MM9.1.1/FXWT-2YQ : accessed 11 Nov 2012), Frances J. Sawyer, 1846. Massachusetts Vital Records, 1841-1910, , Vol: 36 ; Page: 280. Sons of the American Revolution Membership Applications, 1889-1970, Louisville, Kentucky: National Society of the Sons of the American Revolution, , Volume: 270; SAR Membership Number: 53877. Sarah E. Hale was born on June 23, 1828 in Paris, Oxford County, Maine. She was the daughter of Sumner Hale and Harriet Shackley. Sarah died on August 6, 1839 at age 11. 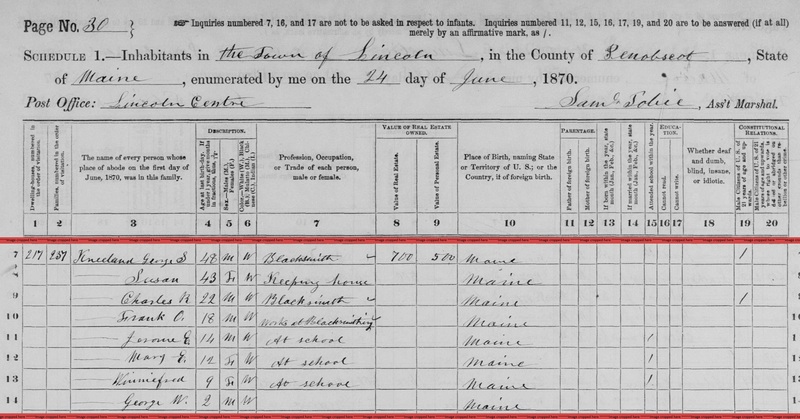 "Massachusetts State Census, 1855," database with images, FamilySearch (https://familysearch.org/ark:/61903/1:1:MQWY-S6N : 15 November 2014), Elbridge G Hale, Ward 02, Cambridge, Middlesex, Massachusetts, United States; State Archives, Boston; FHL microfilm 953,948. She was the daughter of David Hale and Sarah Kingsbury. Non-population Census Schedules for Maine, 1850-1880, Augusta: Maine State Archives, , Archive Collection: 3; ; Census Year: 1870; Census Location: Turner, Androscoggin, Maine; Page: 1; Line: 14. Massachusetts Vital Records, 1841-1910, , Vol: 182 ; Page: 36. 1880 United States. Census Office. 10th census, 1880 federal population census, Washington, District of Columbia: National Archives and Records Service, ([19--]) , FHL Film 1254558; National Archives Film T9-0558; Page 149B. living at Albany, Oxford County, Maine. Vital records of Rutland, Massachusetts, to the end of the year 1849, Worcester, Mass . : F.P. Rice, (1905) , p. 49. Andrew N. Adams, A Genealogical History of Robert Adams of Newbury, Mass., and His Descendants, 1635-1900, , at http://books.google.com/books?id=PQlXAAAAYAAJ . Rutland, Vt.: The Tuttle Co., (1900) , p. 142. 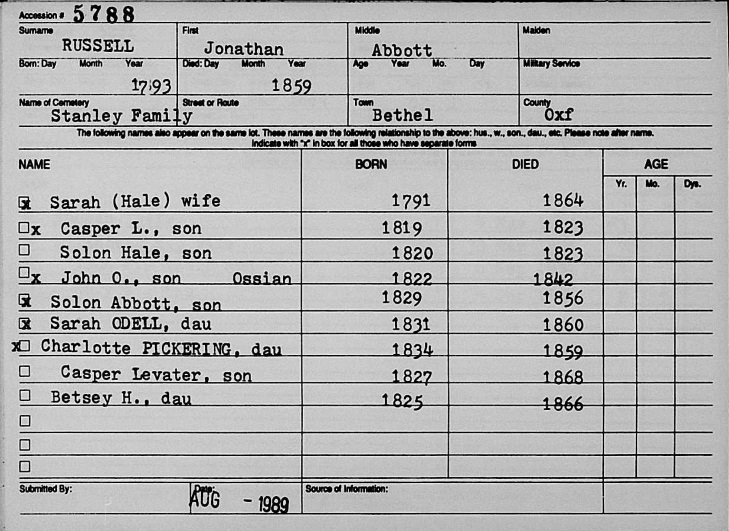 "United States Census, 1860", database with images, FamilySearch (https://familysearch.org/ark:/61903/1:1:MDC7-9LK : 30 December 2015), Sophia H Dresser, 1860. 1880 United States. Census Office. 10th census, 1880 federal population census, Washington, District of Columbia: National Archives and Records Service, ([19--]) , FHL Film 1254475; National Archives Film T9-0475; Page 453A. Sumner Hale was born on July 18, 1806 in Waterford, Oxford County, Maine. Sumner married Harriet Shackley in November, 1827. Sumner died on March 1, 1879 in Augusta, Kennebec County, Maine, at age 72. Robert Safford Hale, Genealogy of descendants of Thomas Hale of Watton, England, and of Newbury, Mass., , at https://archive.org/stream/genealogyofdesce00hale . Albany, N.Y.: Weed, Parsons and Company, printers, (1889) , p. 335. Unknown author, "unknown article title," New England Historic Genealogical Register: Jan. 1988, p. 31. "Maine Births and Christenings, 1739-1900," database, FamilySearch (https://familysearch.org/ark:/61903/1:1:FW1S-Q77 : 4 December 2014), Francis Henry Hale, 10 Mar 1832; citing ; FHL microfilm 11,588. "Massachusetts Marriages, 1841-1915," database with images, FamilySearch (https://familysearch.org/ark:/61903/1:1:N439-LYV : 17 February 2016), William F. Hale and Sarah M. Emerson, 05 Jan 1871; citing , Cambridge, Massachusetts, United States, State Archives, Boston; FHL microfilm 1,433,029. She was the daughter of Charles Hale and Sally Ricker. living at Lincoln, Penobscot County, Maine. Find A Grave Memorial# 33651359. Maine Death Records, 1617-1922, Augusta, Maine: Maine State Archives, , Maine State Archives; Cultural Building, 84 State House Station, Augusta, ME 04333-0084; 1908-1922 Vital Records; Roll #: 30. Ancestry.com, Maine Marriage Records, 1705-1922 [database on-line], Provo, UT, USA: Ancestry.com Operations, Inc., (2010) , Maine State Archives; Cultural Building, 84 State House Station, Augusta, ME 04333-0084; Pre 1892 Delayed Returns; Roll #: 62. Oxford County (Maine). Register of Deeds, Deeds of the Western District, , vol. 111, p. 401. 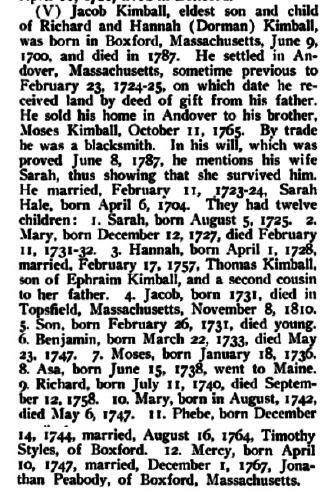 "Maine, Births and Christenings, 1739-1900," index, FamilySearch (https://familysearch.org/pal:/MM9.1.1/F498-W4K : accessed 28 Nov 2012), Winnifred Kneeland, 19 Jan 1861; citing reference , FHL microfilm 9815. 1900 United States. Census Office. 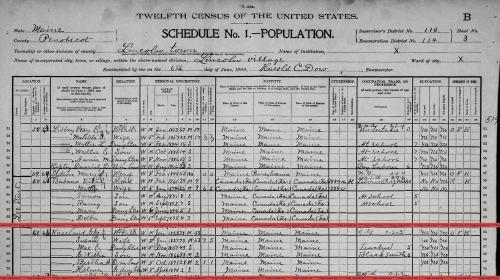 12th census, 1900 population census schedules, Washington, District of Columbia: Bureau of the Census Micro-Film Laboratory, ([197-]) , Census Place: Lincoln, Penobscot, Maine; Roll: T623 598; Page: 3B; Enumeration District: 114. 1880 United States. Census Office. 10th census, 1880 federal population census, Washington, District of Columbia: National Archives and Records Service, ([19--]) , Census Place: Lincoln, Penobscot, Maine; Roll: T9_486; Family History Film: 1254486; Page: 446.2000; Enumeration District: 46; Image: 0494. Find A Grave Memorial# 33651329. 1870 United States. Census Office. 9th census, Population schedules of the ninth census of the United States, 1870, Washington, District of Columbia: The National Archives, (1962, 1968) , Census Place: Lincoln, Penobscot, Maine; Roll: M593_554; Page: 187; Image: 376.